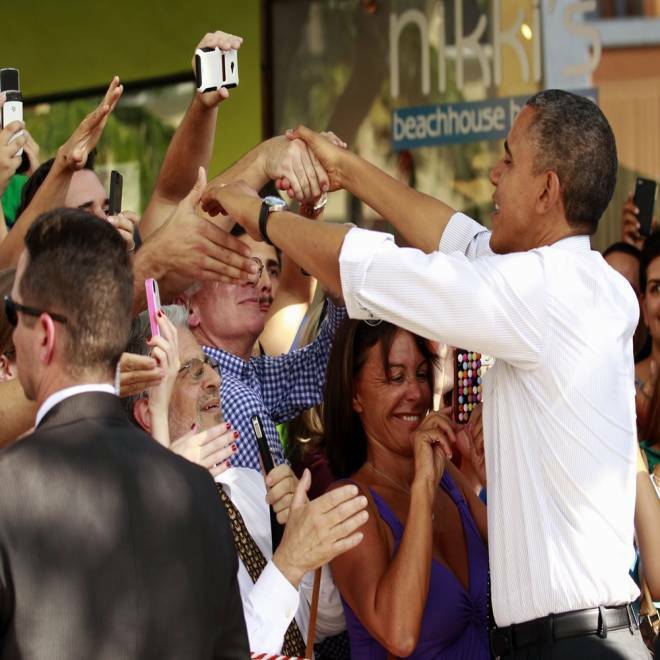 President Barack Obama shakes hands after holding a round table discussion with first time voters at OMG Burger in Miami on Sept. 20, 2012. 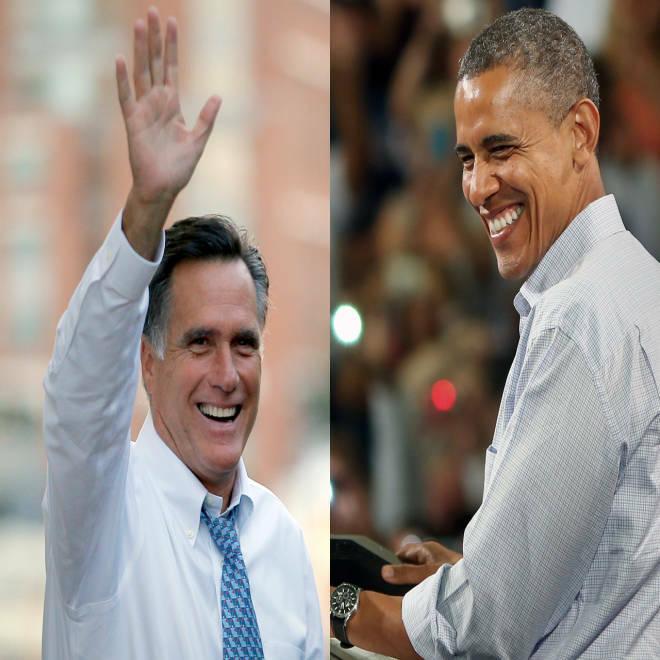 President Barack Obama leads Mitt Romney in Colorado, Iowa and Wisconsin, reaching the key 50 percent support threshold in all three battlegrounds, according to the latest NBC News/Wall Street Journal/Marist polls of these states. In both Colorado and Wisconsin, Obama is ahead by 5 points among likely voters (including those leaning toward a candidate), 50 percent to 45 percent. And in Iowa, the president’s edge over Romney is 8 points, 50 percent to 42 percent. Among a wider sample of registered voters, Obama’s lead is even larger – 6 points in Colorado, 8 in Wisconsin and 11 in Iowa. The results from these new polls are similar to the NBC/WSJ/Marist surveys of Florida, Ohio and Virginia that were released last week. Those showed Obama ahead in all three battlegrounds. And they’re consistent with this week’s national NBC/WSJ poll (conducted by different pollsters) that found Obama up by 5 points among likely voters, 50 percent to 45 percent. These new surveys – conducted after the political firestorm over last week’s attacks on U.S. embassies in Libya and Egypt, and during the melee over a leaked video of Romney talking about the “47 percent” of Americans who are dependent on government and believe they are victims – also show the Republican’s favorability rating in an unenviable place. A plurality of likely voters view Romney in a negative light in all three states. In Colorado, it’s 43 percent favorable to 50 percent unfavorable; in Iowa, it’s 42 percent to 50 percent; and in Wisconsin, it’s 43 percent to 46 percent. By contrast, out of last week’s polls in Florida, Ohio and Virginia, just one of them – Ohio – found Romney’s favorable/unfavorable rating under water. Meanwhile, Obama’s favorable/unfavorable scores in Colorado (51 percent to 45 percent), Iowa (53 percent to 42 percent), and Wisconsin (51 percent to 44 percent) are all above water. Yet the president’s job approval rating in these states is a bit lower – 47 percent in Colorado, 48 percent in Wisconsin, and 49 percent in Iowa. According to these polls, Obama and Romney are essentially battling to a tie on the question of which candidate would do a better job in handling the economy. In Wisconsin, 46 percent of likely voters pick Romney, while 45 percent select Obama. But in Colorado, the president gets 48 percent, and the GOP nominee gets 46 percent. And in Iowa, Obama is up by four points, 47 percent to 43 percent. Yet when it comes to which candidate would do a better job on foreign policy, the president enjoys a double-digit advantage in all three states. In Republican running mate Paul Ryan’s home state of Wisconsin, his favorable/unfavorable score among likely voters is 49 percent to 40 percent (versus 51 percent to 44 percent for Obama, 43 percent to 46 percent for Romney, and 42 percent to 45 percent for Vice President Joe Biden). In Wisconsin’s competitive Senate contest, Democrat Tammy Baldwin gets support from 48 percent of likely voters, and Republican Tommy Thompson gets 46 percent. Obama is ahead among independents in all three states – by 1 point in Wisconsin, 10 points in Iowa and 11 points in Colorado. And there’s a significant gender gap in these three states, with the president up by double digits among women and with Romney slightly ahead among men. The NBC/WSJ/Marist polls were conducted Sept. 16-18 of 971 likely voters in Colorado (which has a margin of error of plus-minus 3.1 percentage points), 898 likely voters in Iowa (plus-minus 3.3 percentage points) and 968 likely voters in Wisconsin (plus-minus 3.2 percentage points). NBC's Domenico Montanaro and Chris Cillizza discuss on MSNBC's Andrea Mitchell Reports Mitt Romney's new moderate tone and new battleground polls showing an advantage for President Barack Obama. About a quarter of all likely voters in these three states were interviewed by cell phone. NBC’s Natalie Cucchiara contributed to this report.